Samsung Electronics, the largest memory device supplier, has toppled Intel from its No. 1 position in the global semiconductor industry thanks to undersupply and higher prices in the memory market in 2017, according to Gartner Inc. However, it will be tough for Samsung to retain its leading position as industry analysts forecast possible oversupply of NAND flash in 2019. Global semiconductor revenue grew 22.2 percent in 2017, reaching $419.7 billion, according to Gartner’s preliminary results for the year. 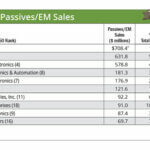 "The largest memory supplier, Samsung Electronics, gained the most market share and took the No. 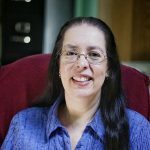 1 position from Intel — the first time Intel has been toppled since 1992," said Andrew Norwood, research vice president at Gartner, in a statement. "Memory accounted for more than two-thirds of all semiconductor revenue growth in 2017, and became the largest semiconductor category." Gartner estimates undersupply in the memory market drove 64 percent revenue growth, which accounted for 31 percent of the total semiconductor revenue in 2017. 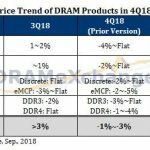 NAND flash and DRAM prices increased 17 percent and 44 percent, respectively. As a result, end equipment from PCs to smartphones also increased in prices last year. The semiconductor industry has hit revenue milestones throughout the year. "The global semiconductor industry reached another key milestone in November, notching its highest-ever monthly sales, and appears poised to reach $400 billion in annual sales for the first time," said John Neuffer, SIA’s president and CEO, in the November report. "Global market growth continues to be led by sales of memory products, but sales of all other major semiconductor categories also increased both month-to-month and year-to-year in November. All regional markets also experienced growth in November, with the Americas continuing to post the strongest gains." Current semiconductor vendor rankings may not last due to weakening memory pricing in 2018, according to Norwood. "Samsung’s lead is literally built on sand, in the form of memory silicon," said Norwood. 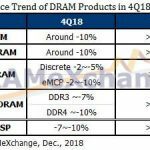 "Memory pricing will weaken in 2018, initially for NAND flash and then DRAM in 2019 as China increases its memory production capacity. We then expect Samsung to lose a lot of the revenue gains it has made." Norwood also expects mergers and acquisitions to impact Samsung’s ranking over the next two years. "The combined revenues of Broadcom, Qualcomm and NXP were $41.2 billion in 2017 — a total beaten only by Samsung and Intel," said Norwood. 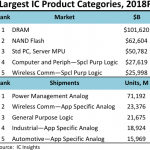 "If Broadcom can finalize this double acquisition and Samsung’s memory revenue falls as forecast, then Samsung could slip to third place during the next memory downturn in 2019." 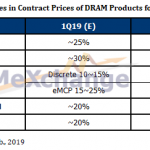 Market research firm DRAMeXchange, a division of TrendForce, also forecasts a possible oversupply of NAND flash in 2019 due to production capacity expansion plans announced by major players including Toshiba, Samsung, Intel and Yangtze Memory Technologies Corp. (YMTC). Toshiba and Western Digital resolved its dispute over a joint venture in December, which extends their existing joint venture agreement to 2029. The announcement “confirms that Western Digital will jointly invest in the Fab 6 facility at Yokkaichi to secure its competitiveness in 3D-NAND Flash with 96-layer or greater,” said DRAMeXchange. Toshiba also announced plans for its Fab 7 construction with a proposed new site at Kitakami, Iwate. Mass production is scheduled in the second half of 2019. The primary devices to be produced at the plant are 3D NAND Flash with 96-layer or greater, said DRAMeXchange. 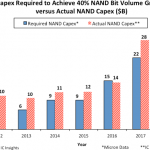 But the market research firm does not expect the new fab to have a “large-scale” impact on the overall NAND flash output until 2020. Other production capacity expansion plans include YMTC’s new site in Wuhan Donghu New Technology Development Zone that will start operation in the second half of 2018 with initial product development focused on 32-layer 3D NAND flash and 64-layer products. Intel also started its second phase fab expansion in Dalian, China, with plans to double the facility’s 3D-NAND flash capacity by the end of 2018, according to DRAMeXchange. Samsung also plans to expand its NAND Flash factory in Xi’an to increase its production of 3D NAND flash in China, while SK Hynix’s new factory, M15, in Cheongju, is expected to start operation in 2018, targeting production of 3D NAND Flash with 96-layer or greater. 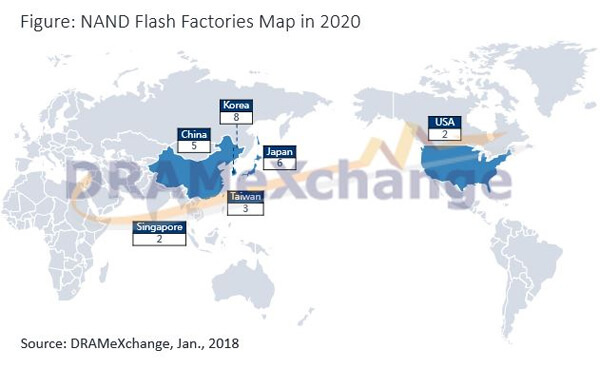 Although an oversupply of 3D NAND flash is forecast for 2019, DRAMeXchange analysts expect 2D NAND devices to account for a smaller portion of manufacturing output, transitioning into a niche market focused on industrial applications.